The first issue of the official Star Wars: The Old Republic online comic has been released, promising valuable insights to hordes of salivating fanboys who just can't wait for BioWare's Next Big Thing. A collaborative effort between Dark Horse, LucasArts and BioWare, Threat of Peace begins during the Sith Empire's vicious attack on the Galactic Republic. The Empire has scored many victories among the planets of the Outer Rim but has thus far been unable to penetrate the core worlds; now, in an unexpected twist, the Empire has offered a ceasefire and despite its misgivings the Republic is desperate enough to begin negotiations. But is the Empire truly interested in peace? Or is there something more to these peace talks than the Jedi Council is aware of? Threat of Peace is written by Rob Chestney, a senior writer at BioWare Austin who is also working on The Old Republic MMOG, and penciled by Alex Sanchez of Dark Horse, who has previously worked on Marvel Age Hulk, Spider-Man and X-Men, 30 Days of Night, JSA Classified and Batman: Joker's Asylum. As you might expect, the webcomic has the distinct look of an actual comic book, and while short - the premiere "issue" is only three pages - the bi-weekly release schedule should keep fans interested. A prelude to Star Wars: The Old Republic, Threat of Peace will tell the tale of the sack of Coruscant and the peace treaty that followed, filling in the blanks of the chaotic days and weeks after, which saw the Empire consolidating its power while the Republic struggled to maintain order among its people. Yet even in victory, quiet, deadly struggles for power continue between the Sith Lords, while the Jedi too are forced to deal with trouble in their ranks as they come to terms with the new balance of power in the galaxy. 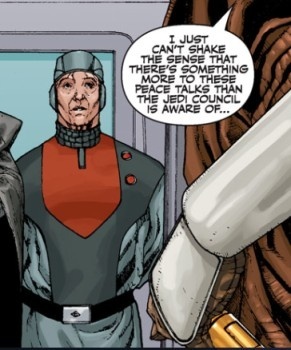 It's only the first issue but my early impression is that Threat of Peace maintains the standard of writing and dialog the Star Wars franchise is famous for. Few lines are spoken, yet what little there is feels as if it could have been written by the very creator of Star Wars himself. It's uncanny, really. See it for yourself in all its Lucasian glory right here. "Lord Angral, how should we respond?" That dialogue literally tastes like high fructose corn syrup, yet I love it. Like most things Star Wars actually. not as kewl as the Dead Space animated graphic novel thing. Going by the looks of things, I believe I've seen this comic back in the day when it was called "The Phantom Menace". ...this couldn't have a more predictable outcome if there was a neon billboard at the bottom of every frame.